Alright, so there's two camps when it comes to brownies: those who like theirs rich and fudgey, and those who like it more cake-like. 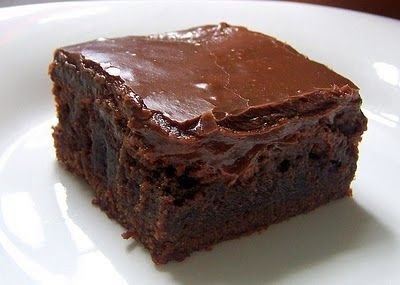 I personally love a fudgier brownie, but these here fall somewhere in between, which makes them a good go-to brownie. These have a frosting, although you certainly don't need to use it. Actually, next time I make these I'll omit that part. They're so dense and rich, the frosting doesn't really add anything. Preheat your oven to 350 degrees (f) and grease a 9"x13" baking pan (I couldn't find mine, so used a 9"x9" and increased the baking time by 10 minutes). Sift together the dry ingredients. Add the butter and vanilla, then add the eggs one at a time, mixing well after each addition. Pour into the prepared pan and bake for about 30 minutes. Set on a wire rack (pan and all) to cool. Make the frosting: Melt the butter over medium heat, then add the remaining ingredients, whisking until smooth and thickened. Pour over still-warm brownies. Allow the frosting to set before slicing. Tips: For easy removal and slicing, line your pan with foil (before greasing). When the brownies have cooled, simply lift them from the pan using the foil. This makes slicing and serving a breeze. To cut the brownies cleanly, heat your knife under hot running water, wipe off the moisture, and then cut. Repeat as necessary.